Paolo Recchia was born in 1980 in Fondi, a small town nearby the coast between Rome and Naples. He was fascinated by the alto saxophone since he was a child and has since developed a passion for it, thanks to his father that had one. He starts playing at age 11, studying classical music and then jazz, which he discovers and starts developing a passion for by listening to recordings by Charlie Parker and Massimo Urbani. At 18 he moves to Rome where he immediately starts an intense professional activity. He participates to master classes held by Bob Mintzer, Rick Margitza, Billy Harper, Harry Allen, Dave Liebman, Enrico Pieranunzi, Chris Potter, Rosario Giuliani, Paolo Fresu. In 2003 at the Premio Massimo Urbani he’s the recipient of a study grant for Siena Jazz; in 2004 he’s 2nd place in Concorso Nazionale‚ “Giovani Talenti del Jazz Italiano” in Piacenza and wins the “Palazzo Valentini Prize” at Jazz & Image Festival in Villa Celimontana, Rome. In 2005 he’s 2nd place at concorso nazionale jazz di Baronissi. Moves for a short time to Paris, playing with Laurent Coq, Alain Jean-Marie, Michel Rosciglione, Stephane Belmondo, Pierre Boussaguet, Remi Vignolo. 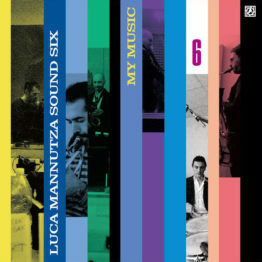 He plays often with “Iodice & Corvini Roma Jazz Ensamble”, PMJO (Parco della Musica Jazz Orchestra) directed by Maurizio Giammarco, “Six Sax” directed by Javier Girotto, “Sound Six” by Luca Mannutza (“Tribute to the sextets in 60’s”, “My Music” – Albore Jazz), Nicola Angelucci 4et for which he records “The First One” for Via Veneto Jazz. His way of communicating through the saxophone, which he embraces since an early age when, like his father says, he could barely hold it, is extremely expressive. A very balanced sound, capable of incredible emotional and passionate leaps, at times nostalgic or that unveal a more intimistic, introspective taste. His compositional style embraces the bebop tradition with frequent excursions in today. And this is probably his strenght, coming from years of intense study of the african-american heritage. In March 2008 his debut recording, “Introducing Paolo Recchia featuring Dado Moroni”, is released for the Italian label Via Veneto Jazz-Emi Music, with Nicola Angelucci on drums, Marco Loddo on bass and special guest Dado Moroni on piano. In Dec 2008, after a long visit in New York, plays 4 nights at Alexander Platz, famous jazz club in Rome, with his quartet and a special guest from New York, tenor saxophonist Joel Frahm. In October 2009 he plays in New York for the “Italian Jazz Days” coproduced by JALC and Italian Cultural Institute and curated by artistic director of JALC Antonio Ciacca and artistc director of Dizzy’s Club Coca Cola Todd Barkan with the participation of Joey De Francesco, George Garzone, Rosario Giuliani, Antonio Ciacca, Gianluca Renzi, Greg Burk, Jeremy Manasia, Ada Rovatti, Lucio Ferrara, Nicola Angelucci, Luca Santaniello, Marco Panascia, Joseph Lepore; he plays for such occasion at the Italian Cultural Institute as part of Antonio Ciacca’s Quartet. In 2010 he is invited once again to participate in the “Italian Jazz Days”, festival and performs at Dizzy’s Club Coca Cola with organist Pat Bianchi with Emanuele Basentini on guitar and Peppe Merolla on drums. Others who have took part of the festival are: Dado Moroni Quintet, Joe Lovano and Antonio Ciacca Quintet, Lucio Ferrara Quartet and Orsara Jazz Ensemble, Eugenio Macchia Trio & Friends, Stefania Tschantret Quintet, Enrico Granafei Trio with Marco di Gennaro. In 2013, he releases a new CD “Three for Getz” (Albore Jazz, Japan), with Enrico Bracco and Nicola Borrelli, the music dedicated to the great Cool Jazz icon; Stan Getz. In 2015, he has the new urge to develope his musical idea in the same trio: the project called “Peace Hotel”.